Holi is known as the festival of colors in India. Celebrations are typically marked by the splashing of colors on family and friends. It is a spring festival and also the happiest and most colorful religious festival of the Hindus. It is celebrated on the first day of Chaitra. On this occasion we forget our old quarrels and mix with all freely. At least for one day we forget social distinctions completely and there is no difference between the rich and the poor. Holi gives us a great joy. Since Holi is approaching, so the Foodie Monday Blog Hop team has come up with a theme as 'Holi on my platter'. 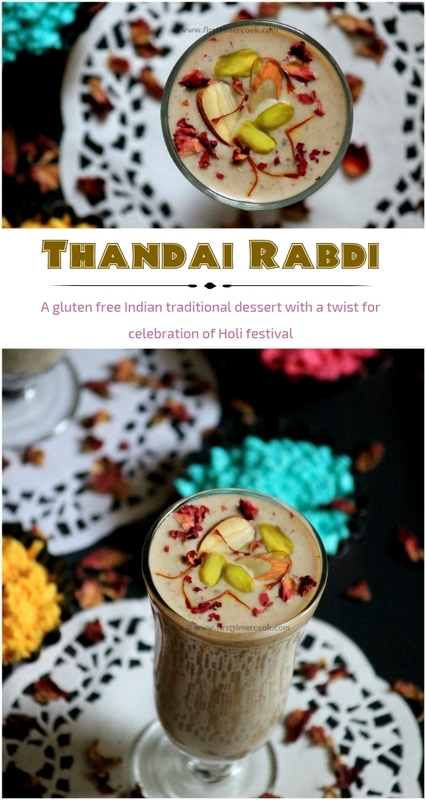 I have prepared a fusion dessert with a touch of holi festival, named as Thandai Rabdi and contributed for the theme. Well, who doesn't love rabdi or rabri !! Though I am not at all a fond of sweets, but still I love to prepare rabdi for my family. This very rich dessert, rabdi is made by condensing full fat milk in a large open vessel until it reaches approximately 1/3rd of the original amount. To this traditionally delicious dessert, I have given a fusion in the form of thandai masala powder. First the full fat milk is thickened, then flavored with the thandai masala powder along with sugar and some rose essence. 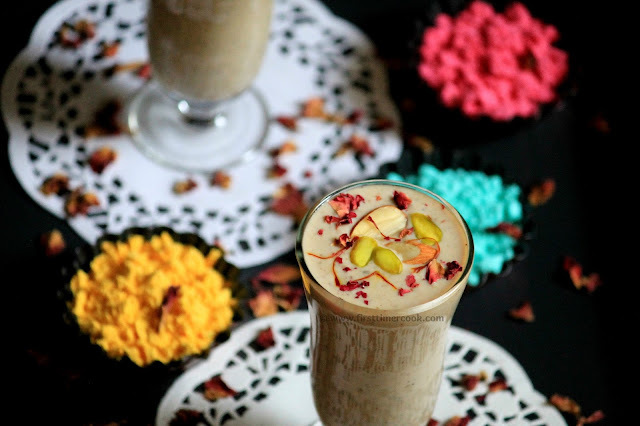 The thandai powder is a semi-coarse or fine mixture of cashews, almonds, pistachios, melon seeds, fennel seeds, rose petals, pepper corns, green cardamoms, poppy seeds, saffrons and many other according to individual preferences. 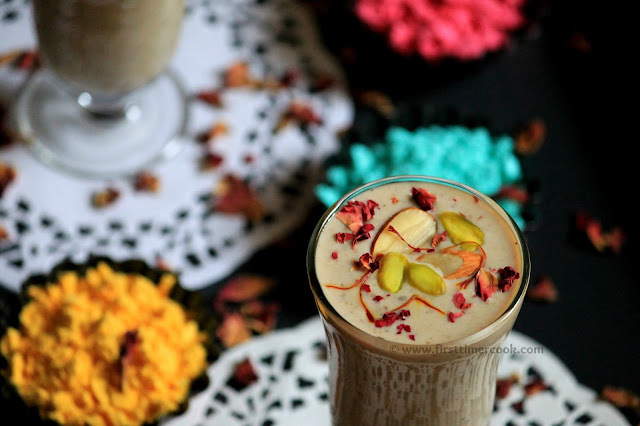 Holi festival means thandai masala flavored dishes are must to be prepared for celebration. Thandai and thandai rabdi are both milk based chilled sweet dishes with the touch of thandai masala powder. 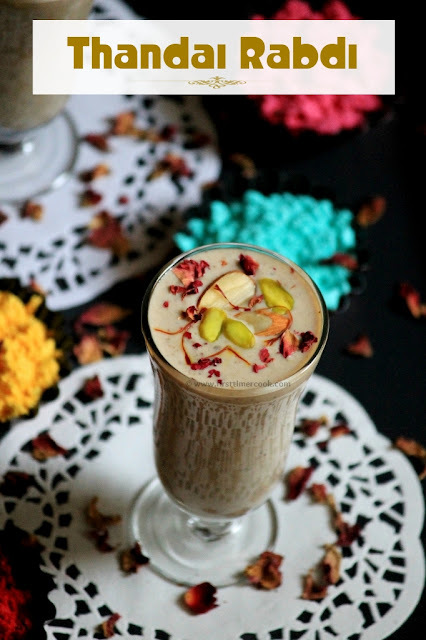 But thandai is a beverage prepared by just adding the thandai masala powder to the simple boiled milk, where as thandai rabdi is a dessert by adding the thandai masala powder to thickened or condensed milk. The thandai masala powder used here is homemade and also the ready-made powder from market can be used instead, but if using the market brought powder, then just adjust the sugar quantity as per the sweetness desire. So for this coming Holi, do make this fusion dessert as rabdi with thandai flavor at home and enjoy with your loved ones. Lets go in details. Boil milk in a broad and heavy bottomed pan over medium heat. When milk starts to boil, reduce heat to low. Stir at regular intervals of 3-4 minutes and also scrap all the cream chunks which are being stick to the side of the pan. Cook until milk is reduced to 1/3 of original quantity. Then add thandai masala powder, rose essence, sugar and stir to mix well. Again cook stirring in between and scraping the cream chunks. Continue for 8-10 minutes more or until the thick and grainy texture of the rabdi is achieved. Turn off heat and allow the rabdi to cool at room temperature. At the time of serving, just pour in serving bowl topped with sliced nuts and serve chilled ! Always prefer to use broad and heavy bottomed pan, otherwise milk will stick to the bottom easily. Do not stir too much while cooking. Keep some interval of stirring, otherwise the cream will not form perfectly. The amount of thandai masala powder can be varied as desire. 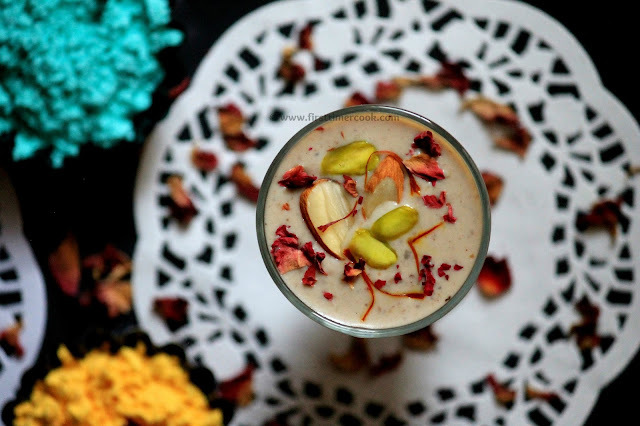 The Thandai rabdi looks so inviting..perfect share for the theme ! Sasmita I cannot imagine not liking sweet things! Lovely tempting rabdi... may make this for Holi. This recipe is gonna be a huge hit with guests!A totally wow share! This Thandai Rabdi looks so sinful. Drooling over the pics sasmita. Fantastic share.